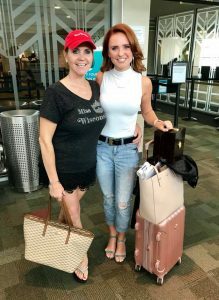 Upon re-clasping my heels and sliding my bracelets back onto my wrist after walking through security, I made my way past various gates. Naturally, I stopped for snacks and water (a flight/travel essential to keep my skin and body well hydrated) before turning to walk down the ramp toward Gate 13 within Dane County Regional Airport. At that very moment my eyes welled up with tears. “This was actually happening,” I said to myself. After years of dreaming of what this national experience would entail, hoping and praying my day would come, it was here. My flight from Madison to the Philadelphia airport ended up landing about twenty-minutes early (in what universe does that happen?). 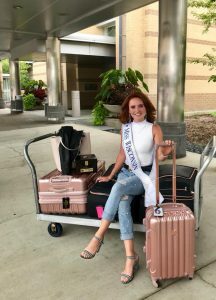 I texted the Miss America security team to inform them I would be making my way to baggage claim, and I stepped off the plane with heightened excitement. Upon grabbing my three suitcases, Lewis (a security guard with the MAO) walked me to another baggage area where I discovered many of my sisters gathered ready to board the jitney to Atlantic City! Caesars ladies boarding the chariot upon arriving at our ‘new home’ for our duration in AC! Check them out at @CaesarsAC – Twitter. We boarded the jitney, chatting about the unknown, our travels, and personal lives a little more as we made the hour trek to Atlantic City. 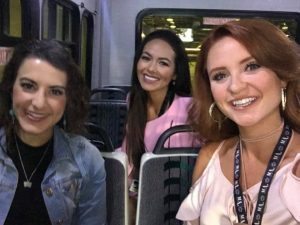 I sat by Miss Maine, Olivia Mayo, on the bus who is an absolute doll! We discovered our similar majors and career aspirations as she is currently pursuing a degree in communication and media! We all shared more details about our Show Us Your Shoes Parade outfit themes and exchanged photos of the finished products. If I’m being honest, the parade was something I had anticipated for years. In fact, the past couple years my vision for a cranberry themed emerald green sequin costume evolved greatly. I knew precisely what I would do (being born and raised in Central Wisconsin—AKA “cranberry country) if I ever won the coveted title of Miss Wisconsin. Nonetheless, I was eager to see everyone else’s choices as a direct extension of their own personal style, interests, and overall passions. I will elaborate more on the parade with a later post; stay tuned! Upon arriving in Atlantic City, we pulled into the underground parking beneath Boardwalk Hall (which we soon would become extremely familiar with) to drop off competition wardrobe before making stops at various hotels to drop us off in groups with our respective hostesses. I stayed at Caesars. I remember seeing the large white horses stationed on the corner lot of the hotel as we pulled up under the main entrance. My roommate, Miss District of Columbia, Allison Farris, was not arriving until the following day so I took some time to decompress and settle into my environment. Wednesday morning began bright and early with fittings at Boardwalk Hall. 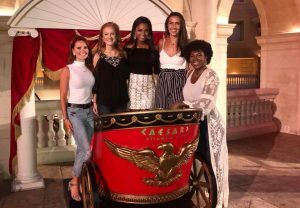 Miss Montana, Laura, Miss Maryland, Adrianna, and I (pictured left to right) left our hotel to see the dressing room for the very first time. As we walked in, tables lined the room in three neat rows; each depicting a different competition group (Sigma, Alpha, and Mu). The tables had mirrors for each of us with bright lights, complete with small printed out images of our headshots with our state name adorning the top lefthand corner of the mirror. 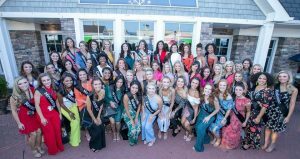 The seamstress crew gave us instructions to try each of our competition wardrobe pieces on in order (Parade of States, On-Stage Interview, Red Carpet, Talent, Crowning, etc.) in order for them to easily take photos of them to get approved for the telecast. I just have to say, the ladies helping behind the scenes on wardrobe pieces were absolutely incredible! Not only were they available during our fittings, but throughout our entire two weeks! 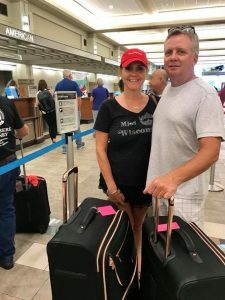 They ensured our items were steamed and were at the ready to fix any wardrobe issues that occurred, helping to make us candidates look and feel our best! We were welcomed upon our arrival at Bocca by local media outlets and community members thrilled to say hello! We gathered for a group photo prior to entering the facility and finding our seats for dinner. Lou, the owner certainly won over our hearts (and stomachs) not only on Wednesday, but over the entire duration of our stay in A.C. He catered breakfast and lunch for us while we were at Boardwalk Hall for rehearsals and let me tell you, it was delicious! From scallops and stuffed meatballs, to various quiche and breakfast burritos, there was something for everyone. A special, sincere thank you to Lou and his staff for keeping up fed, energized, and in constant awe of their talents! P.S. There was even a dessert bar at the restaurant on Wednesday night. Yes, you read that right. Cookies, cheesecake bites, cake pops, salt water taffy, etc.—the works. 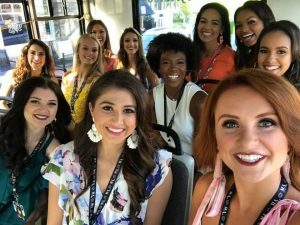 This is just the first of a series of recap posts about my Miss America experience! Are you excited? I know I am! One thing I was strict about while in Atlantic City was taking time in the evenings and during breaks at rehearsals to journal my thoughts, feelings, and experiences from that day. Now, it’s time to share that insight and joy with all of you!